Explanation: What flowers in this field of dark star dust? The Iris Nebula. The striking blue colour of the Iris Nebula is created by light from the bright star SAO 19158 reflecting off of a dense patch of normally dark dust. Not only is the star itself mostly blue, but blue light from the star is preferentially reflected by the dust -- the same affect that makes Earth's sky blue. The brown tint of the pervasive dust comes partly from photoluminescence -- dust converting ultraviolet radiation to red light. Catalogued as NGC 7023, the Iris Nebula is studied frequently because of the unusual prevalence there of Polycyclic Aromatic Hydrocarbons (PAHs), complex molecules that are also released on Earth during the incomplete combustion of wood fires. 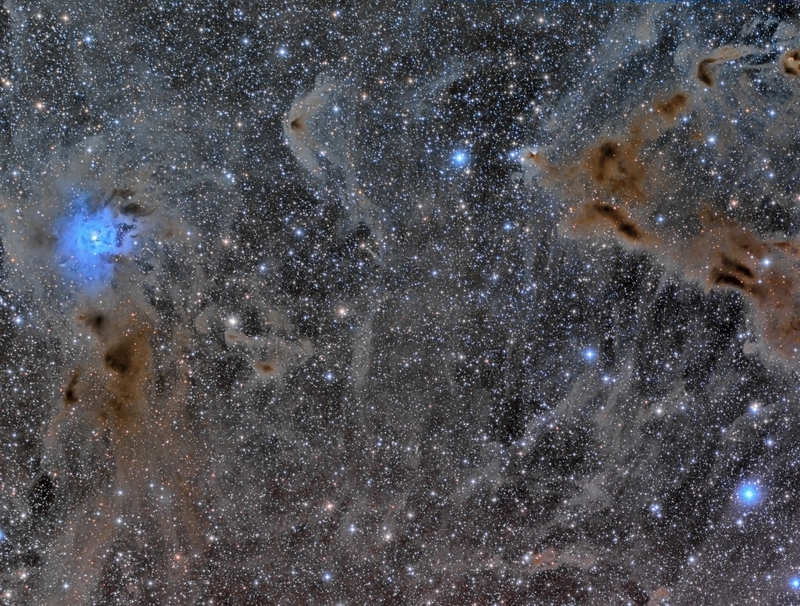 The bright blue portion of the Iris Nebula spans about six light years. The Iris Nebula, pictured above, lies about 1300 light years distant and can be found with a small telescope toward the constellation of Cepheus.